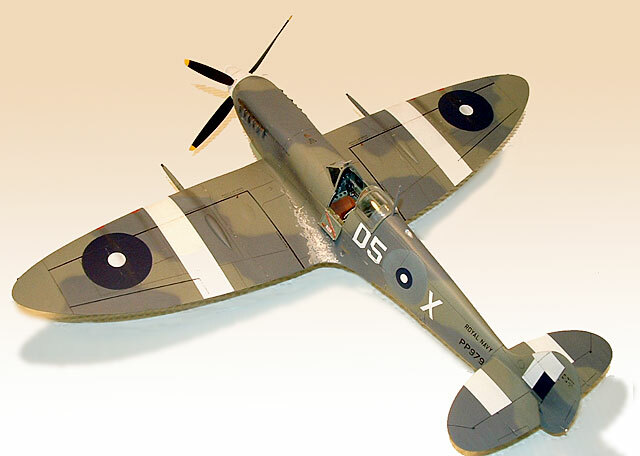 I am submitting yet another Spitfire- this project was a conversion of a Hasegawa 1/32 scale Spitfire Mk.Vb to a Seafire L. Mk.III. This build was a joint venture. The basic building, cockpit interior and resin Seafire conversions were done by my friend Vince Hutson. I cleaned it up, finished off all of the re-scribing, added details, cockpit door and landing gear etc. were needed, and did the paint job. 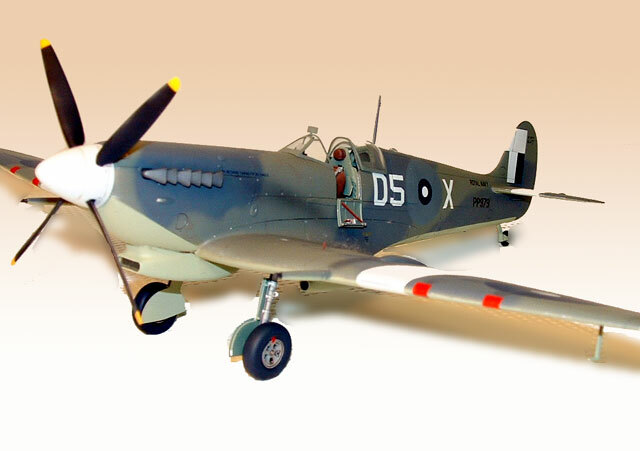 To build this kit, we used an Airwaves Seafire III conversion kit, which included the resin conversion for the air intake, prop an spinner, cannon barrels, wing cannon covers, tail hook and exhaust stacks and metal fuselage strengthening stringers. The interior was completed using a mix of a Eduard photo etched set for the MK 5b and a few placards from Waldron. The model was painted using Model Master enamel, decals were applied over a coat of Floquil Crystal Clear and sealed using a mix of 80% Floquil flat and 20% Floquil Semi-Gloss. As for the markings, the roundels are all painted, the numbers are miscellaneous decals form the spares box and the rest are kit decals. The finished model represents Seafire L. Mk.III # PP979 D5 X of 807 Sqdn while serving aboard HMS Hunter in the British East Indies Fleet. 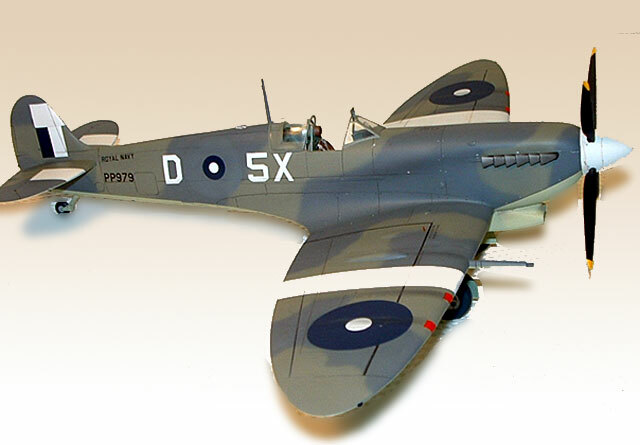 The camouflage scheme is Extra Dark Sea Grey/Slate Grey over Sky Type S. This specific aircraft carried SEAC-type roundels over the original factory applied post May 1942 style roundels which can be seen to be painted out. This was a fun project to build and research. 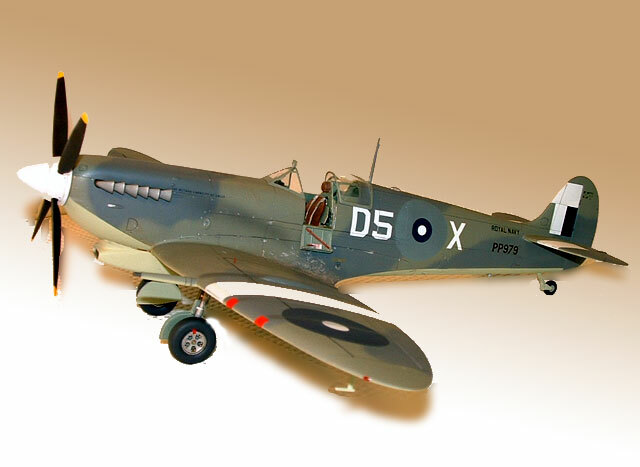 The main reference I used was "The Supermarine Spitfire" by SAM publications. Hope you like it as much as we had in building it.